The Freer Rattlesnake Roundup attracts more than 35,000 visitors who gather at the Freer Cactus Corral for the biggest party in Texas. The event is a weekend salute that celebrates the area's most famous resident. 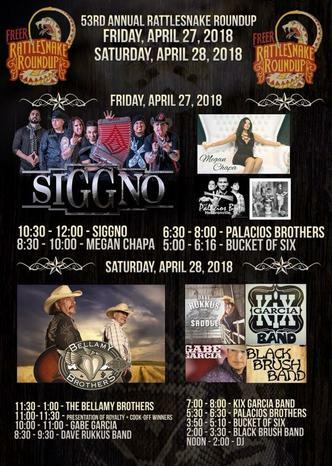 Fun for all ages, the Freer Rattlesnake Roundup includes indoor concerts featuring country and Tejano music stars. Other attractions include a Saturday parade, carnival, arts and crafts fair, dances, stage shows, strolling grounds entertainment, daredevil snake shows, and traditional rattlesnake hunt and contest. Fried rattlesnake and other foods available. For more information, contact the Freer Chamber of Commerce at (361) 394-6891.